i have been down here in marina del rey the last couple days and i’m on my way way. i went and visited tri in the biggest hospital i think i have ever seen in my life. he seemed to be wearing his paper gown pretty well. he also said some of the nurses there are pretty hot and that he’s feeling gross in his gown getup. i played basketball for a couple hours with chester last night and nearly blacked out from the activity. it was a good tuneup for abe’s turkey day basketball challenge coming up in a couple weeks. 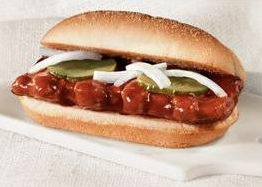 and, i saved the biggest news for last, but i had a mcrib sandwich last night! finally! i felt like ordering 100 and taking them home and putting them in the fridge for later consumption, but perhaps i’ll just wait to see if they come back to the bay area in the next months.